Asa Newell, born 2/27/1764, in that part of West Dedham which became known as Dover. 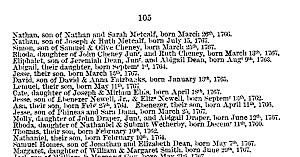 His birth is recorded in "Vital Records of Dedham, 1635-1845", Hanson, Robert B. and in "Record of Births, Marriages, and Deaths, Vols. I and II, 1635-1845", Hill, Don Gleason. 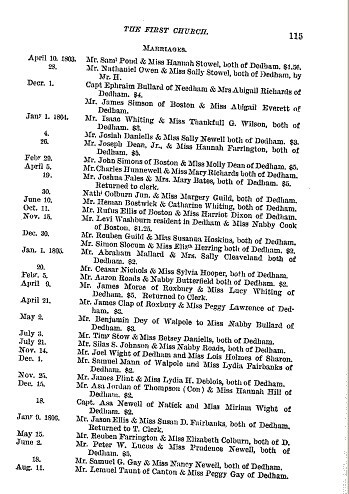 Asa Newell's only marriage was to Miriam White of Dedham. They were married December 18, 1805, by the Reverend Joshua Bates in the First Church of Dedham. The first record is from "Record of Births, Marriages, and Deaths, Vols I and II, 1635-1845", Hill, Don Gleason. 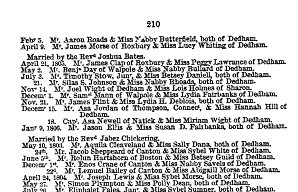 The second record is from "First Church of Dedham Records, 1638-1844", Hanson, Robert B.